If you want a pink polo shirt to wear to the zoo on March 28, you must let Peggy know at pjmcgee@cox.net by noon today, March 4. If you order after that, we cannot guarantee delivery by March 25. Order now and she will collect the $18 at a later date (Peggy will be at the Baby Shower Committee meeting on Monday morning and you could pay her then). Peggy needs orders for six more shirts to place her order today. Please remember that the shirts run small, so order at least one size larger than you normally wear. The Scholarship Committee is conducting formal interviews today in preparation for making awards. The $1,000 awards, one each to graduating females from Sahuarita High and Walden Grove, will be announced no later than March 11th. Through a most challenging process, the committee narrowed the field from fifteen outstanding and worthy applicants to six, three representing each school. Everyone is excited about the prospects…. 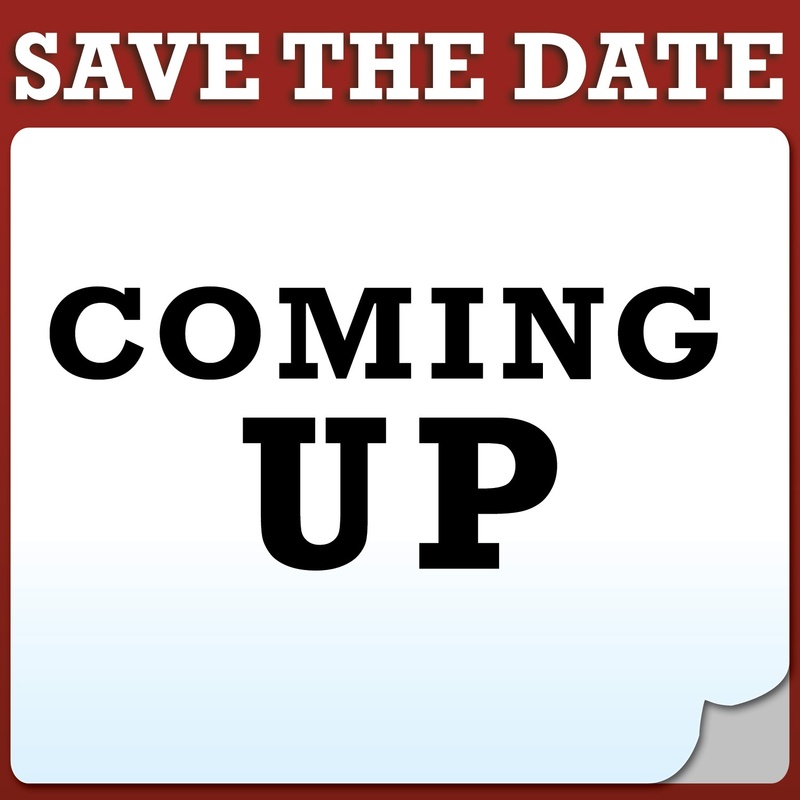 watch for a special announcement next week! As of today, there are 24 days to go! There are only 4 tickets left for a seat on the bus. Grab a friend, get those last four tickets and join us for the Reid Park Zoo field trip! Tickets are $40 ($45 for non-members) and include bus transportation, lunch and a “behind the scenes” tour! It has been suggested to wear close-toed shoes or tennis shoes. 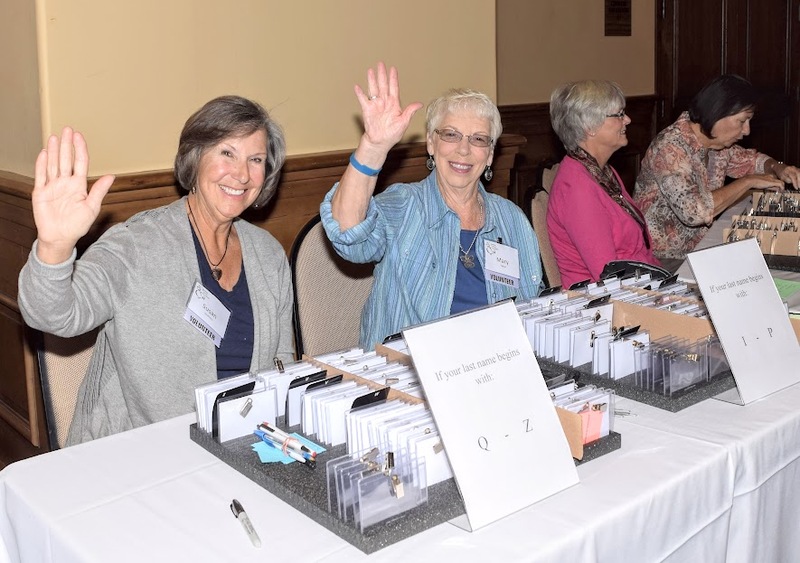 You may contact Nancy Wilson with questions at nanwil60@aol.com. The buses will depart from the Clubhouse promptly at 9:00am on Monday, March 28, and return around 4:00pm. This is one trip you will not want to miss! So that you are not left behind, please arrive by 8:15am to check-in. Thank you to Jed Dodd for an awesome program last month, “What’s New at the Zoo”. We all learned so much about the animals, how they are trained, the purpose of a zoo, and what we can expect on our field trip this month. If you were not able to attend, check out the program pictures that include a few zoo creatures: What’s New at the Zoo. Lucky door prize winners won items from the Reid Park Zoo gift shop. Wow, $261 was collected at the program on Monday. What a great start! The total participants registered for the shower is currently 30 parents and 31 babies as there is one set of twins. We are now full and will not be registering anymore! 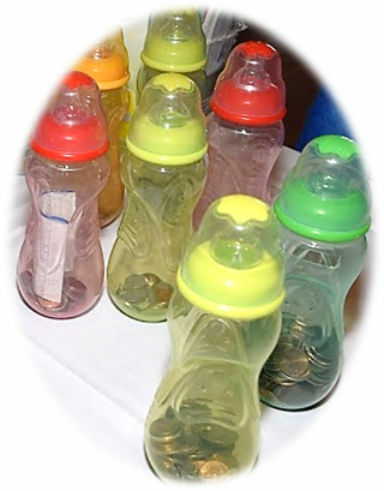 Cash is also most welcome, as we would be able to add to the existing supply or fill in with items that do not get donated. Contact Pamela Rodgers with any questions at 520-561-7969 or prodgersaz@gmail.com. Donations may also be dropped off at her home, 2640 E. Sawyer Road (drop box on front porch) or call she will be glad to pick them up in the Quail Creek/Green Valley area. You will also find collection boxes at the Madera Clubhouse lobby and the Anza Fitness Center. Many of you have seen and already purchased the awesome aprons that TWOQC are currently selling to support YOTO. What is YOTO, you ask? This is a group that is assisting homeless teens in the Green Valley/Sahuarita area. The program is a dropout prevention program that supports the high school graduation of homeless unaccompanied youth who are in 6th grade up to age twenty-one. They have a very well-organized process for rewarding these teens to be accountable for their actions and their future. 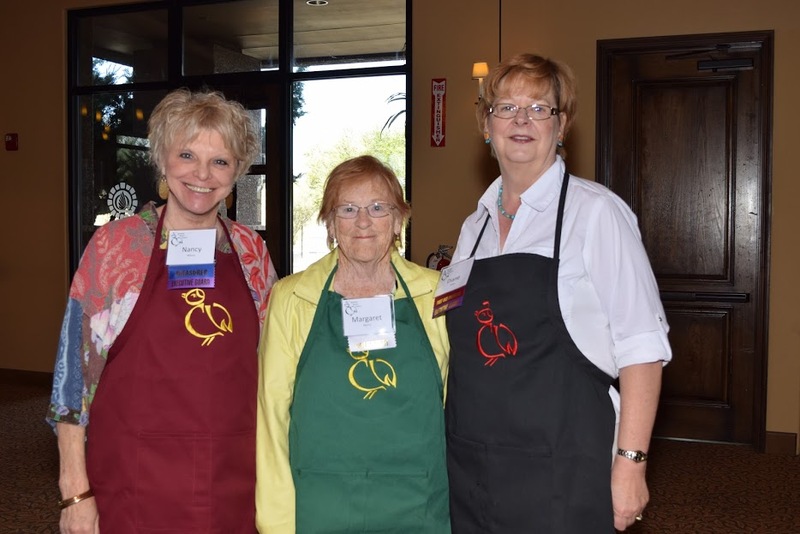 If you have not purchased your apron yet they will be available on Saturday, March 12 from 10:00am to 4pm at the TWOQC table at the Madera Clubhouse. There are five colors and sell for $18 each or two for $35. They are not just great in the kitchen – they are also fun for BBQ, crafting or working with tools in the garage! Be thinking ahead for Christmas or birthday gifts! 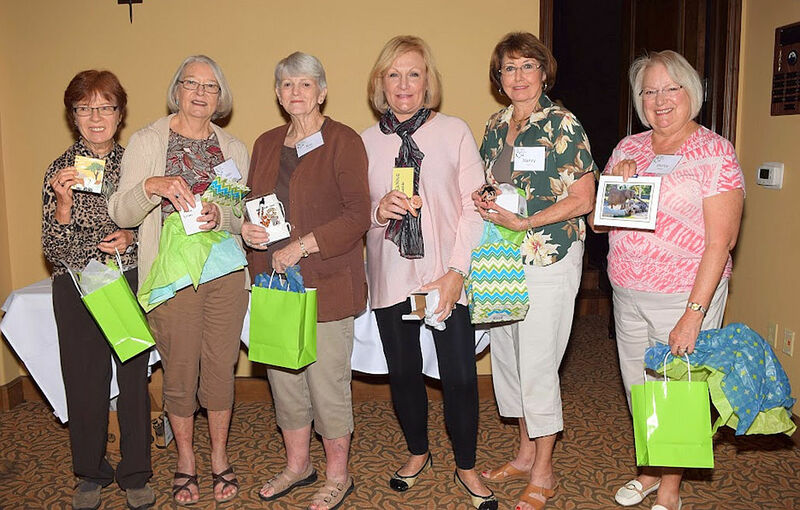 Thank you to all the volunteers that made last Monday’s program a success: Linda Bradley, Kathy Hanson, Cindy Hogg, Margaret Morris, Sue Struthers, and Mary Talton. We could not have such great programs without you! Thanks for the donations for the homeless and hospitalized veterans. Peggy took 15+ lbs. of toiletries, calendars, note cards and clothing items to the VA on March 1. The National Guard was delighted to receive the coupons this week, just in time for their drill weekend on March 5-6. Keep them coming. They especially appreciate the restaurant coupons—it seems they tend to eat out after the weekend drills. Peggy Richmond sent a total of $5,151 in coupons to the Naval Base in Sasebo, Japan! After the Fashion Show there were several brooches turned in to Nancy Jacobs. 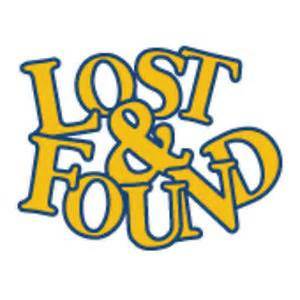 If you discovered that you have lost one please contact Nancy at nancyajacobs@yahoo.com or (970)946-3910 to retrieve. 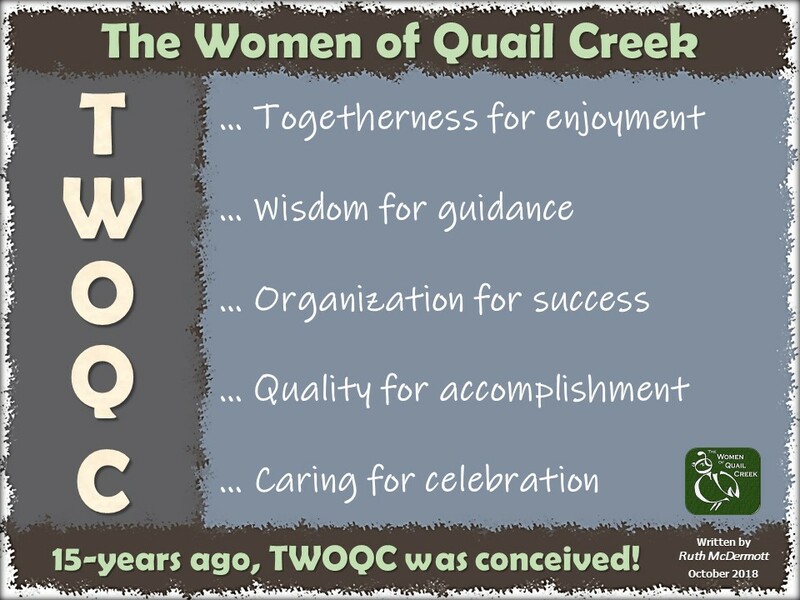 This entry was posted in Announcements and tagged green valley, quail creek country club, the women of quail creek, twoqc facebook. Bookmark the permalink.